The THV profile bending machine represents an optimal solution for cold bending of any kind of profile on the market as well as pipes and tubes. The THV models are designed to offer the opportunity to exploit the machine with its shafts in the vertical or horizontal orientation. 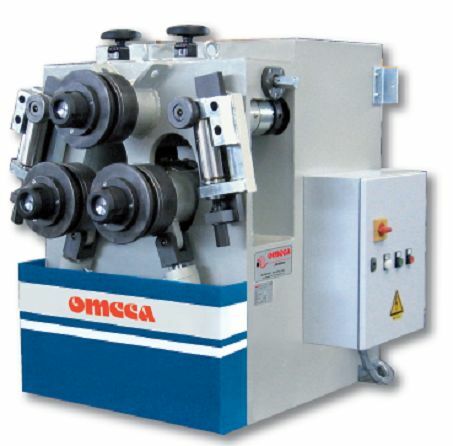 These machine are suitable to bend profiles of small and medium size. They are supplied according to the needs of the customer, equipped with 2 or 3 driven rolls in rotation allowing the powerful drag of the profile. The top roll is fixed while the 2 bottom rolls are equipped with independent planetary movements. All movements are hydraulic. The THV profile bending machine of structural soundness is capable of precision work and finished products can be achieved with extremely close tolerances.